Visitors and locals alike love cheering for the collegiate, youth, and professional teams who play their hearts out for fans in Stockton. 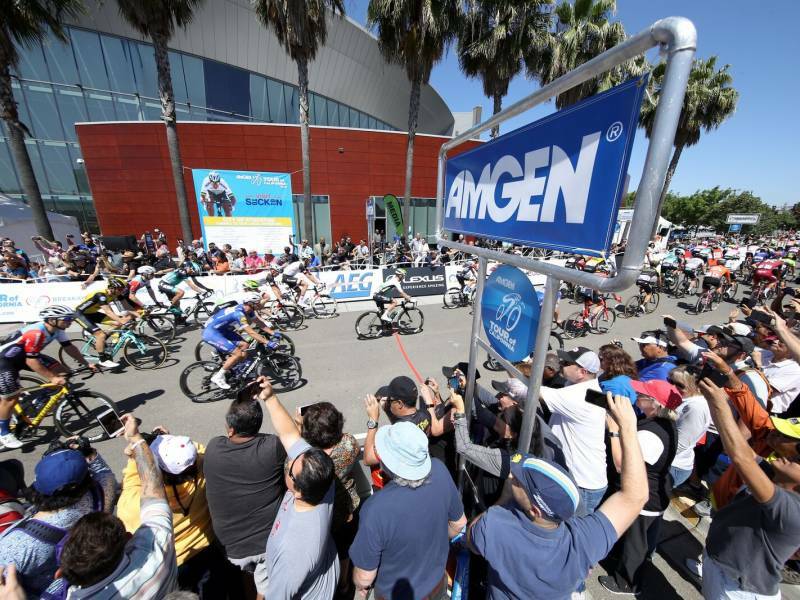 Considered America's largest and most prestigious professional road cycling stage race, the Amgen Tour of California, will return to Stockton for the second year in a row in 2019! Downtown Stockton will serve as a start location for Stage 3 of the race as riders make their way south to Morgan Hill, California on May 14. Learn more. From October through April, hockey fans bundle up and head over to the Stockton Arena to see their favorite Stockton Heat players fight for greatness. As an AHL affiliate of the Calgary Flames, the level of play is top-notch. Each season players are called up for their chance to play out their dreams in the NHL. See 2018-19 schedule here. Watch NBA G League basketball action in Stockton, California! Prepare to see a handful of dunks, alley-oops, and three-pointer scores from Stockton Kings players inside the Stockton Arena. The season starts in October with a total of 48 games, 25 of which are home games running until March. See 2018-19 schedule here. Pacific offers collegiate athletics at its finest. Water polo, women's basketball, beach volleyball, tennis, volleyball, and more bring excitement to Stockton during the school year. Top-notch facilities, dedicated coaches, and determined student athletes make games, meets, and matches exciting to watch. Catch the Pacific Pep Band at the next Men's Basketball game and let them know you want more cowbell - they won't disappoint! Delta College has a dynamic athletics department comprised of strong male and female student athletes. Catch a soccer, baseball, or football game with the family or spend a day watching water polo matches. There is something for everyone to enjoy. A day at the races + a dirt track = an adventure you won't soon forget. Experience all the fun dirt track racing has to offer and meet some amazing people along the way. If high-octane adventure is your brand of fun, the Stockton 99 Speedway for you. NASCAR racing on a 1/4 mile track will get your blood running fast and put a smile on your face! Cheering on the Port City Roller Girls is a great way to spend an evening. If you haven't seen flat-track women's roller derby bouts before, you are in for a treat. These women leave it all on the floor and have fun in the process. Always available to assist with community events and showing young girls what strength and teamwork looks like, this organization has earned a dedicated following. As the Oakland Athletics Single A affiliate, the Stockton Ports baseball enters its 69th year as part of the California league. A beloved part of Stockton's history, catching a game at the waterfront Stockton (Banner Island) Ballpark is a family favorite activity. Every April through September friends can't wait to eat hot dogs, root for their home team, and take in the post-game fireworks display (at select home games throughout the season). See the 2019 schedule here. For more information on Stockton sports, including golf course listings, visit our "Stocked Full of Sports" page here. If you are involved in youth sports and are considering a location to host tournaments and championship games, consider Stockton. Text us at 877.778.6258 between 8AM and 8PM, seven days a week, and we will assist you and your event organizers. Stay social with Visit Stockton on Facebook, Twitter, and Instagram - and be sure to use #VisitStockton during your visit!